During the late nineteenth century, dozens of other entrepreneurs had also created corporate empires, though some were called names much less complimentary. 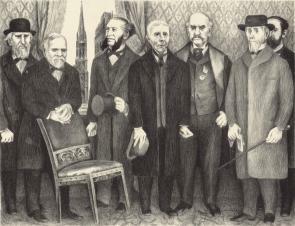 The “Big Four”—Leland Stanford, Collis P. Huntington, Charles Crocker, and Mark Hopkins—led the Southern Pacific Railroad (the SP), and their company was often reviled as “the Octopus,” with its many tentacles grasping for control over all transportation in California and the Southwest. The SP was reputed to charge local shippers as much as possible, to the point where local businessmen told of bringing their ledgers to the SP so the railroad could determine the maximum it could charge without bankrupting them. Whether “Empire Builder” or “Octopus,” powerful corporate entrepreneurs transformed the nation’s economy during the thirty-five years following the Civil War. At the war’s end (1865), the large majority of American manufacturing was carried on by small businesses serving a local market. Relatively few manufacturers thought in terms of a national market, partly because of limited transportation facilities. Few major rivers had been bridged, railroads still operated on various gauges (the distance between the rails), which meant that cars could not be easily switched from one line to another, and most rails were still of iron, which limited the weight that they could carry. All that changed within a single generation. One revolution was in transportation and communication. Between 1865 and 1890, railroads grew from 35,000 miles of track to 167,000 miles. By the 1880s, the nation had an elaborate network of steel rails, with a common gauge, connecting all major population centers. Technological advances improved the power of locomotives, the safety of braking systems, and the carrying capacity of freight trains. Technological advances in communication came not only from high-speed mail trains but also from expansion of the pre-war telegraph system and the introduction of telephones beginning in the late 1870s. Improved transportation and communication permitted ambitious entrepreneurs to think in terms of a national market. A second revolution was in the financing of railroads and other new industrial corporations. Building railroads was expensive—more so than almost any other business. Railroad executives soon came to rely on investment bankers to assist in raising capital. By the late 1880s, John Pierpont Morgan had emerged as the nation’s leading investment banker. Son of a successful banker, young Morgan was educated in Europe, began working in his father’s bank in London, then moved to a bank in New York. Railroads had a voracious appetite for funds, but Morgan’s investors wanted to put their money where it would be safe and provide a reliable return. Morgan therefore tried to stabilize the railroad business. When companies came to Morgan for funds, he often insisted on reorganization to simplify corporate structures and combine separate lines into larger, centrally controlled systems. He also often insisted that a representative of the House of Morgan be added to the company’s board of directors, so that the company would continue to follow policies that would provide a safe and reliable return on Morgan’s investment. Some began to call this process “Morganization,” and “Morganized” lines included some of the largest in the country. A few other investment bankers followed similar patterns. By the early 1900s, such reorganization had created twelve large railroad systems that controlled more than half of all the country’s railroad mileage, and twenty others that operated most of the rest. The largest systems were interlocked with each other into a half dozen massive networks, each affiliated with a leading New York banking house. By then, Morgan had already turned his attention to other industries, especially steel. A third revolution was in the size and structure of manufacturing. The career of Andrew Carnegie in the steel industry provides an example. He was born in Scotland in 1835, and his penniless parents brought him to the United States in 1848. After a short time working in a textile mill, he became a messenger in a telegraph office, then a telegraph operator, then the personal telegrapher for a high official of the Pennsylvania Railroad, one of the largest in the country. At the age of 25, he moved into a high management position with the railroad. After five years there, he went into the iron and steel industry, where he applied the management lessons he had learned with the railroad. Carnegie’s motto was “Cut the prices; scoop the market; run the mills full”—that is, set prices low enough to undercut his competitors and always run his plants at full capacity so that his capital investment produced the highest possible return. He took every opportunity to cut costs so that he might show a profit while charging less than his rivals. In 1864, steel rails sold for $126 per ton; by 1875, Carnegie was selling them for $69 per ton. Driven by improved technology and Carnegie’s competitiveness, steel prices continued to fall, reaching less than $20 in the late 1890s. By then, the nation led the world in steel production. Carnegie’s steel plants stood at one end of a long chain of operations that he owned outright or controlled through partnerships: iron ore mines, ships that transported iron ore across the Great Lakes, railway lines, coal lands, ovens to produce coke (coal treated to burn at high temperatures), and plants for turning iron ore into iron and steel. Bringing together all these operations under one company is called vertical integration—and it was something new to American manufacturing. Control over the sources and transportation of raw materials guaranteed a reliable flow of crucial supplies at predictable prices—and may also have denied raw materials to competitors. Carnegie and other leading entrepreneurs saw technology as another competitive device, permitting the production of better quality goods at lower prices. In 1901, Carnegie sold his company to J.P. Morgan who then combined Carnegie’s operations with other steel companies he had invested in, creating United States Steel, the country’s first corporation capitalized at more than a billion dollars. Carnegie’s company was larger and more complex than any manufacturing enterprise in pre–Civil War America but was by no means unique in the late nineteenth century. Other companies also operated large and complex plants—by 1900, three steel plants each employed between 8,000 and 10,000 workers, and seventy other factories employed more than 2,000 workers, producing everything from locomotives to processed meat. Some companies operated more than one giant factory. Carnegie Steel ran two of the seventy largest factories, as did General Electric and Western Electric. Where Carnegie Steel sold his steel mostly to other large companies, Standard Oil sold mostly to final consumers. Standard Oil, run by John D. Rockefeller and his partners, revolutionized the petroleum industry. At the time, the major product of oil refining was kerosene, used primarily for home lighting. Rockefeller, in 1863, invested in a refinery in Cleveland, Ohio, then the center of petroleum refining—a business relatively easy to enter but highly competitive. Like Carnegie, Rockefeller was an aggressive competitor. He usually sought to persuade his competitors to join the cartel he was creating. Failing that, he would try to drive them out of business. By 1881, Rockefeller and his associates controlled some forty oil refineries, accounting for about 90 percent of the nation’s refining capacity, giving them a monopoly (monopoly means “one seller”) over refining. Monopolizing one step in the manufacturing process is also called horizontal integration. In the 1880s, Standard moved to vertical integration by gaining control of oil fields, building its own transportation facilities (including pipelines and oceangoing tanker ships), and creating its own marketing operations. By the early 1890s, Standard Oil had achieved virtually complete vertical and horizontal integration of the American petroleum industry—something unusual in American business. Standard’s monopoly proved to be short-lived, however. With the discovery of new oil fields in Texas and elsewhere, new companies tapped those fields and quickly followed the path of vertical integration. By the early 1880s, Rockefeller and his partners controlled companies in several states, but state laws required companies to operate only in the state in which they were chartered. To centralize decision-making in all their holdings, they created the Standard Oil trust, a new organizational form. Rockefeller and his partners who held shares in the individual companies exchanged their stock for trust certificates issued by Standard Oil. Standard Oil thus controlled all the individual companies, though technically it did not own them. Having centralized decision-making, Standard Oil consolidated its operations by closing more than half of its refineries and building several larger plants that incorporated the newest technology. One outcome was greater efficiency—the cost of producing petroleum products fell significantly, as did prices paid by consumers. Soon, new laws in New Jersey permitted corporations chartered there to own stock in other companies. So Rockefeller set up Standard Oil of New Jersey as a holding company for all the companies in the trust. Though the trust was only a temporary expedient for Rockefeller, the term trust quickly became synonymous with monopoly and then was applied to any large industrial enterprise. Rockefeller retired from active participation in business in the mid-1890s. By then, Standard Oil no longer had a monopoly, but the “Rockefeller interests” (companies dominated by the Rockefeller family) had become highly diverse and even more powerful. They included the National City Bank of New York (an investment bank second only to the House of Morgan), railroads, mining, real estate, steel plants, steamship lines, and other industries. Other entrepreneurs followed the paths marked out by Carnegie and Rockefeller, creating vertically integrated manufacturing enterprises and seeking to monopolize whole industries. Few such entrepreneurs managed to achieve a monopoly, but dozens created powerful corporations. Henry Miller and his partner, Charles Lux, for example, created a meat-packing empire in the western United States. Both began as retail butchers, attracted to San Francisco by the gold rush that began in 1848. From selling meat to customers, they integrated backwards to establish a slaughterhouse and packing plant, preparing meat for sale to many retail butchers. Then they integrated backward another step to establish huge cattle ranches in California’s San Joaquin Valley and elsewhere. Their company eventually owned or leased thousands of square miles of land in three states. By 1900, it was the largest vertically integrated cattle-raising and meat-packing company in the country, and the only agricultural corporation among the country’s 200 largest industrial corporations. Other entrepreneurs in Chicago, notably Gustavus Swift, developed meatpacking companies that were vertically integrated from the packing plant forward to the retail butcher. None of them had a monopoly, but the meatpacking industry was dominated by a small number of companies, a situation called an oligopoly (oligopoly means “few sellers”). Other industries had also become oligopolistic by the early twentieth century. Eventually, as the original empire-builders passed from the scene, most of these companies passed under the control of managers, chosen by the company’s board of directors, and usually unknown to most Americans. Today, few Americans can name the president of US Steel, Exxon (formerly Standard Oil of New Jersey), or Swift and Company. Americans disagreed over the accomplishments of these corporate empire builders. Some accepted them as benefactors of the nation. Others agreed with E. L. Godkin, a journalist at the time, who compared one railroad tycoon to a medieval robber baron—a feudal lord who robbed all travelers who passed through his domain. Subsequent historians have also disagreed. Some point out that many corporate empire builders of the late nineteenth century were unscrupulous, greedy, exploitative, and antisocial, and that some of them bribed public officials to get what they wanted. Looking at only such deeds or misdeeds of individuals does tell us something about both the economy and the public morality of the time, and helps us understand the public anger that eventually led to federal regulation. However, understanding the larger economic changes of the era requires more than an examination of individual behavior, whether despicable or praiseworthy. We need, instead, to seek to understand the ways that their activities transformed the economy. We need to understand the new corporate structures that they created, that usually survived the individual entrepreneur who created them, and that came to dominate the national economy in the twentieth century. We need to understand, too, that, in the process of building their individual empires and accumulating vast personal wealth, these entrepreneurs made the United States the most powerful nation in the world by the beginning of the twentieth century. Robert W. Cherny is a professor of history at San Francisco State University. His books include California Women and Politics: From the Gold Rush to the Great Depression (2011) with co-editors Mary Ann Irwin and Ann Marie Wilson; American Politics in the Gilded Age, 1868–1900 (1997); San Francisco, 1865–1932 (1986), with William Issel; and A Righteous Cause: The Life of William Jennings Bryan (1985, reprint 1994).